Ah, summer marches on, the back to school ads appear in the paper and the next issue of FC comes through the mail slot. So, who's cooking from 118? I had a response, but it vanished, so I will reply tomorrow Pie...love that corn! Let's see if this time the post goes well. I made the pork souvlaki salad and it was very yummy. I love tsatziki so I made a double batch just ot have with some pita for snacks. The pasta with the cream sauce was a bit heavy for me. The addition of the lemon zest was definitely noticeable and made the sauce come alive. I would however alter it next time so it is not so heavy. For left overs I added shrimp and it was a nice addition. The charred corn was very good. 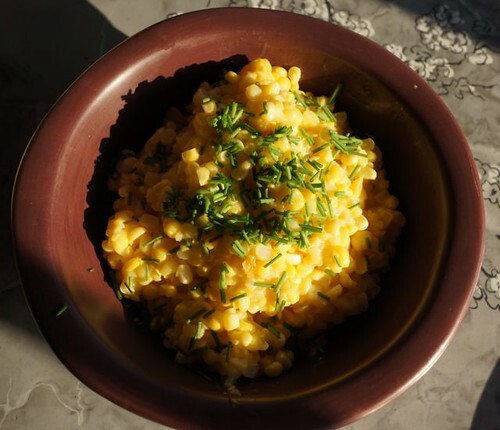 Our corn is just starting to come out and it was a lovely way to have a quick side that really featured the vegetable itself. A few weeks back I made these summer crepes, they are not from FC but they have ricotta in them with a sour cream sauce on top. oh my! these are on the "to be made again" list. If you would like I can post the recipe. Everything looks fantastic, but I am heading for that salad maybe for dinner one night. Short cooking week for me as I will be going out of town so I have to use what is in the vegetable bin before I leave. The salad is a perfect way to use all the little lettuces and lots of cucumbers in the bin. Thanks for the idea. I made this one last night and it was really good! It is the one with the yogurt ginger vinagrette. I found these cucumbers at the market...had never seen them in my life. They were very cool looking and a neat addition. They taste very close to english cucumbers but they are firmer and don't have as much water. Lovely salads, gals! kg, is that a cucumber or a chayote? I haven't made anything else, alas, but I'm eyeing that souvlaki salad. Problem is, I have a whole pig but no tenderloins (they got cut up into chops), so I feel silly about buying more pork! I am eyeing some of those custards though... especially the chocolate chiffon pie! it is a cucumber, really! isn't it strange looking? I swear it is a cucumber, I grew up with chayotes. Well, I am working my way through the issue. I made the italian marinade for steak and it was pretty good, but I forgot to take a picture...I have one more steak marinading so if i remember I'll take a picture. 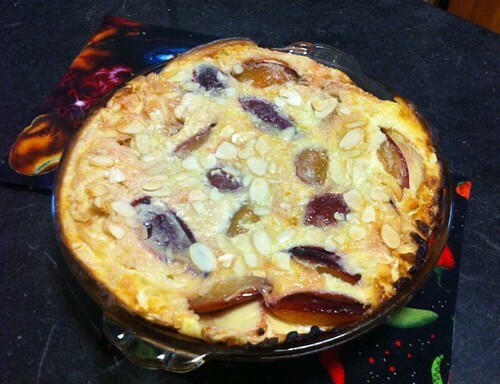 Thanks pie for reminding me of the clafoutis, it was delicious and a big hit at a dinner party I was invited to. The fig tart was AMAZING! I have never mixed goat cheese with sweet recipes. I didn't add the rosemary as I didn't have any but I am sure it would've added to the complexity of the dish. Hey, you got to the clafoutis before I did! I have plums, but they are just lurking at the bottom of the "crisper", reproachfully. Did you make plum jam too? Thanks for the good review, it does look good, as does the fig tart. So, not to jinx you or anything, but your pictures seem to be posting fine-- I hope it continues! It was really yummy. I also just bought the barefoot contessa paris cookbook and they have a pear clafoutis in there so I am itching to make that one too. Done! I didn't have any brandy, so I used rum-- hooboy, the rum-plum sugar syrup was a real treat by itself. Then the tender fruit, with a bit of rum and the soft custard, yumyumyum. The clafoutis was delicious! Thanks for the prodding! I'm having the leftovers for breakfast! That looks delicious. I didn't have any booze at all so I just left it out all together but now it makes me want to make it again with the booze :) after your description. Yeah, it was really yummy. Mine fell quite a bit after baking, did yours too? Yeah, mine fell a lot too and looked kind of sad-- but the powdered sugar covered up a multitude of sins. I'm glad I took a photo of it fresh out of the oven. It's funny because I just made the puffed pear pancake from 119 too-- but the clafoutis was much better. Maybe it was the rum. I think I might make the chocolate cake from 119 next. What's on your list? I have made the beans and almonds this weekend and will hopefully make the turkey soup which I'll make with chicken. I took a photo of the beans, they were very yummy! I would love to make the pumpkin cake again this year but boy I just can't find the time to make a cake and then what do I do with a whole cake??? Here they are, the little beauties-- country ribs in front, spares in back, child munching on ribs behind counter! The country ribs were delicious-- succulent meat and a sweet-tangy mustard glaze. I should have given them a few more coats of glaze. 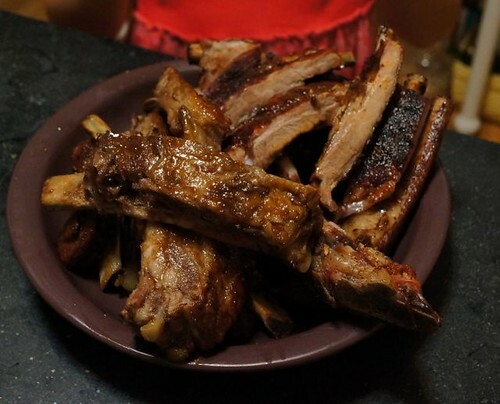 Of course, nothing can compare to spare ribs-- those were the real hit of the day!